Immediately, you might have noticed something wrong with my title. Handwriting isn’t really recommended during the early years, according to Charlotte Mason. Since the “sit down and write” type of work starts at the age of six, using her philosophy, Charlotte Mason handwriting isn’t a thing until our little cherubs have exited their early years. Education during these years is also very child-driven, and few mothers I know are willing to squelch a child’s natural desire to learn. Or wrestle a purple crayon out of the hand of a five-year-old who desperately wants to write letters. Speaking from experience. In our home, there’s a very eager-to-learn child who started to write letters all on her own, just for fun, over a year ago. If I don’t give her any direction, she will get in the habit of forming letters incorrectly. 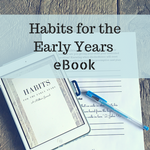 When we are ready for formal lessons, we’ll have to spend time correcting these habits that I just let happen because I don’t want to start formal lessons yet. So, for the sake of good habits, I’m going to help my five-year-old form her letters correctly. Using several of Charlotte Mason’s passages about writing, I’ve decided how I’ll approach early years handwriting. The problem with being completely hands-off with our eager-to-learn children during these early years is that they may soon believe that their letter formation is right. While Charlotte Mason is specifically talking about writing during formal lessons here, I don’t see why his “moral sense” would not be “vitiated” or “his eye injured” just because he is writing voluntarily before the age of six. The longer letters are formed incorrectly, the longer it will take to help a child form them correctly. Our sand tray for letter formation. I used affiliate links here to share some sand tray options with you. There are several Melissa and Doug sets that come in pretty wooden trays. We have this stamp set and this this bead set , and we’ve upcycled the trays to practice letter writing. I painted the bottom so that the letter stands out more. You could also try using colored sand , but it’s much less expensive to buy a big bag at your local home improvement store (and then you can use the rest of the sand for other things!) Of course, you might be able to find a flat platter at the dollar store that works well for this. You can even buy wooden sand trays on Amazon, but I’d rather upcycle something that we already have! H started out writing this way, and right now, E (2) enjoys making lines and curves. I’m interested to see when he’ll want to start making letters, too! When we aren’t using the sand tray, I put it, sand and all, in a gallon-sized zipper bag and store it up high. Since these years are child-led, I don’t recommend throwing your child’s work out the door when it doesn’t look amazing. A five-year-old’s best handwriting won’t look the same as a ten-year-old’s best work. What’s more important than looking perfect during the early years is that they are formed correctly. But, there are some problems that you probably want to address right away. Interchanging the lower case versions of these letters is very typical. I often say that as a first grade teacher, it didn’t worry me at all, but as a third grade teacher, I started to get a little nervous. As a fourth grade teacher, b and d reversals might indicate that a child needs some further intervention. A few months ago, my husband came to me with a piece of paper, and a puzzled look on his face. Our daughter had written her name entirely backward. Cause for concern? No! Young children often do this! I just congratulated her effort, and then said, “Wait…doesn’t your name start with an H?” I was not about to make her write her name over again (at this point, at least!) but I did want to gently draw her attention to what happened. The next time we read a book together, I pointed out that words and sentences always begin on the left side. Like I mentioned before, my self-starter will pick up anything she can to write- pencils, pens, crayons, paint brushes… There was no stopping her. She loves to write any time she gets the chance. If your child is not like this, please don’t worry at all, and please don’t rush your child into writing with a pencil. But, just like the other habits we’ve talked about so far, pencil grip is a habit that’s hard to change once it’s ingrained in your child. Help your self-motivated child to hold a pencil correctly from the start. While those squishy pencil grippers we remember from childhood can help, keep in mind that there is more than one way to correctly hold a pencil. This post from OT Mom Learning Activities helpfully explains correct pencil grip options. Charlotte Mason handwriting is never a game of “drill and kill.” When our children get older, they will practice handwriting through meaningful copywork. During these early years, handwriting should be child led, enjoyable, and as far from “drill and kill” as we can get it. I think that sounds like a good choice for her! Would you correct a 3yr old who taught themself to write and does not form letters correctly or wait until they are older?